Last year, BART rejected a proposal to build a parking structure at its Dublin-Pleasanton station, instead coming up with strategies to provide the same amount of parking for less money while encouraging bike, walk, and transit trips to the station. The alternative strategies were in keeping with new state, regional, and BART’s own environmental and climate goals. But some were not pleased. Assemblymember Catharine Baker and County Supervisor Scott Haggerty insisted that a new parking structure, which would provide less than a third of the parking spaces on the station’s current waitlist, was absolutely necessary. Baker said she could get $20 million for the project—which is expected to cost about $30 million plus—and she did not like BART’s substitute strategies. So the Alameda County General Services Agency applied for a grant from the California Transit and Intercity Capital Rail Program (TIRCP) to build a structure on a county-owned parcel next to the BART station. The Alameda GSA doesn’t have anything to do with transit. So it got the Livermore Amador Valley Transit Authority (LAVTA) to sign on as the responsible transit agency. But LAVTA gains nothing from a parking structure at BART. Its core function is to provide a connection between BART and other places in Livermore. But among the list of grantees announced last week this one stands out like a sore thumb. It has a name that sounds good: “Dublin/Pleasanton Capacity Improvement and Congestion Reduction Program.” A more accurate name could be “More Car Storage and Inducements to Drive.” Does parking “modernize” transit? The project claims, as one can guess from its title, to reduce congestion (not a goal of the TIRCP, by the way) and to reduce greenhouse gas emissions—presumably by encouraging freeway drivers to pull off and park at the BART station, instead of driving all the way to their destinations. It also admits it won’t serve any disadvantaged communities, as called for by A.B. 1550—although the grant includes funding “to identify opportunities to enhance benefits to such communities.” In other words, that pesky detail will be figured out later. The structure, says the grant, “will include electric vehicle charging stations with preferred parking for vanpools to maximize utilization” and “will be built with convertible uses in mind.” That last is in response to claims that autonomous vehicles and ride-hail and who knows what new thing (electric bikes?) will render parking altogether moot in the future, the idea being that when that comes to pass, the structure could be turned into housing or office space. Even though housing for people is a little more desperately needed right now than housing for cars. 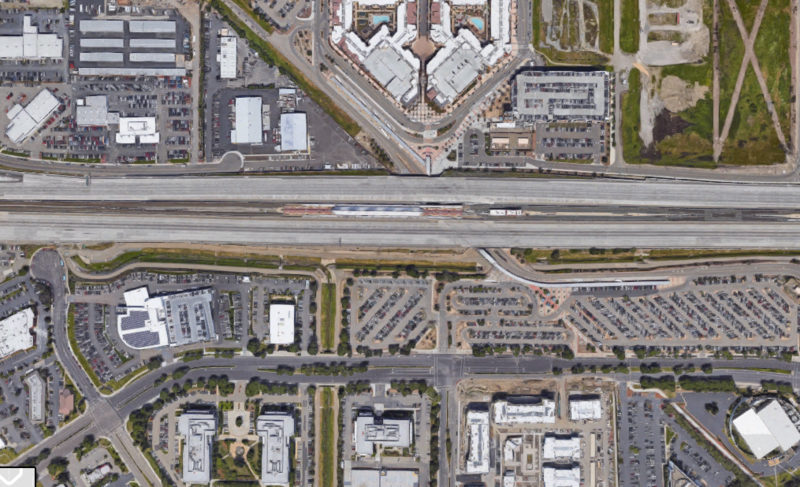 The Dublin/Pleasanton BART station, at center in this image from Google Maps, is in the middle of a freeway and surrounded by seas of parking, which makes getting to it by walking, biking, and bus harder than it should be. BART’s alternative plan, for way less than the $30 million the structure will cost, would have improved bike and pedestrian station access, formalized parking sharing at existing lots, and added car lifts, stacked parking, and attendants to make more spaces available in existing parking structures. Both Saltzman and [BART] General Manager Grace Crunican quoted recent conversations they had with CalSTA Secretary Brian Kelly, who cautioned them that use of the $20 million was entirely at the discretion of Assemblymember Baker. I’ve always thought Google should include a “transit + short bike trip” (say, under 2-3 miles) option. Right and that is how people like you and I would make the transfer. There needs to be a solution for the remaining 95% of ACE passengers. BTW, one of the most vivid cases where “transfer by bike” is a game changer is between SF Caltrain and the SF ferry building. Ask any transit routing tool like 511 or google maps to plan a trip from the South Bay to Marin or Sonoma counties and you’ll be routed the long way around through the East Bay, a 3-5 hour trip. But with a bike you can quickly ride from Caltrain to the Ferry building and cut that time in half. Two miles can be covered in 10 minutes at a very easy 12 mph bicycle pace. The area immediately around that terminal BART stop already has some pretty decent bike infrastructure. The main problem are density and poor connections. This part of Dublin-Pleasanton-Livermore is a sprawling low density area, making travel distances long which discourages walking and biking to the station. If ACE connected better to BART it could be like an electric spark that could enable ACE to provide access to the BART network. As it is now ACE riders coming in from the east are looking at a half hour+ bus transfer to BART. 30 minutes to travel 2 miles (4 MPH!) is pathetic. No wonder few commuters use ACE+BART. Take that $30M and use it as a down payment to get proper direct ACE-BART transfers. The result would be a significant expansion of ACE services and fewer commuters clogging I-580. Another parking garage will just make matters worse. So the alternate hybrid design could provide as much parking without a new structure, and provide it more quickly and at a lower cost. Isn’t that something a fiscally prudent Republican would support? Whatever they decide with the parking, I hope BART also pursues the ideas to better connect the station to surrounding land uses with improved pedestrian and bicycle facilities. A local assemblymember secured a promise of $20 million in state funding to build a parking garage for BART. But in the interim staff had come up with intriguing alternative proposals, and the board of directors opted for the quicker and less expensive option. BART's recently adopted Station Access Policy states that even at “auto-dependent” stations like Dublin, parking should only be considered only after investments are made in walking, biking, and transit infrastructure. It costs $2.25 to go one block on the Geary 38 bus, but someone driving a Tesla can use all of San Francisco's streets for free. That’s fundamentally inequitable. Will future transportation systems fix that?